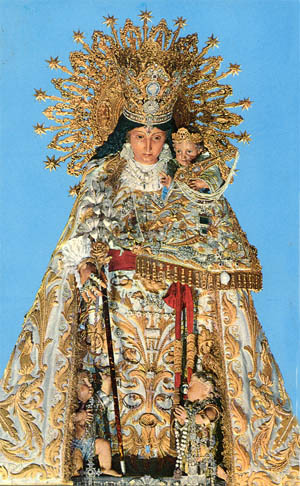 Today in Valencia, Spain, it is the feast day of Our Lady of the Abandoned Ones (Virgen de los Desamparados). In the 15th century, a confraternity was founded in Valencia to take care of abandoned children, under the invocation of Our Lady of the Abandoned Ones. The institute was established but lacked a statue to preside over it. One day three extraordinarily handsome youths knocked on its door, asking for asylum. They offered to carve the needed statue in payment for shelter. They only asked that appropriate material be provided and that they be left alone and undisturbed in a room to work at ease for three days. The offer was accepted. During the three days, the youths remained locked in the room. At the end of that time, the brothers went to inquire if they needed anything. The door was locked and no one responded to their requests to open it. Finally, they forced the door open and entered, but there was no sign of the three young men. Instead, in the center of the room they found a majestic and protective statue of Our Lady that the young men had carved. This extraordinary fact was followed by countless miracles worked on behalf of the Virgen de los Desamparados. 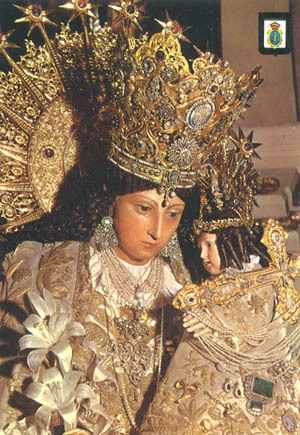 In 1885 Our Lady of the Abandoned Ones was proclaimed Patroness of Valencia. Here you see how this devotion to Our Lady of the Abandoned Ones started. As with so many others, it began with a wonder, a marvel, a miracle. Those three youths who appeared in Valencia were probably three Angels who enveloped what they would do in mystery and expectation. The fact of being extraordinarily handsome boys asking shelter already hints of some mystery: Would they be princes or nobles? Perhaps they were the sons of some family of high lineage who needed to hide their children for a while and would later come to retrieve them or place them elsewhere. Many such conjectures could have been made by the brothers who received them. Another enigma was their peculiar proposition. Probably they seemed capable children, but would they be skillful enough to carve a beautiful statue? Again, another mystery. Then, the work began, but no one was permitted to enter or check its development. Some of the brothers or children who lived in the asylum most probably stood outside the door to see if they could hear something. Perhaps one heard a marvelous hymn being sung inside, another would recount that he was overcome by a supernatural atmosphere emanating from the locked room. When the three days were over, some of the head brothers went to see what had been accomplished. Inside the room was complete silence. The general curiosity grew. They knocked on the door, but there was no answer. They forced it open, but no one was there. What they found was a beautiful statue in the center of the room. The selection found two very good adjectives to describe it: majestic and protective. It is beautiful to find this combination of majesty and protection. It signifies the goodness, mercy, and assistance that comes from a sovereign. So the expression of the statue and the name given it, Our Lady of the Abandoned Ones, fits perfectly with the institution for which it was made. At first, the title pertained specifically to the abandoned children. Then, as its fame spread with miracles, its first sense was amplified and the statue became Our Lady of all the abandoned, be they children, adults, or old people. The popularity of the devotion became such that she was proclaimed Patroness of Valencia and installed in a special chapel that became a Basilica dedicated to her, the Basilica of Our Lady of the Abandoned Ones. That is, when man is completely abandoned, it is necessary to have hope, because this is the moment that Our Lady will give her assistance.